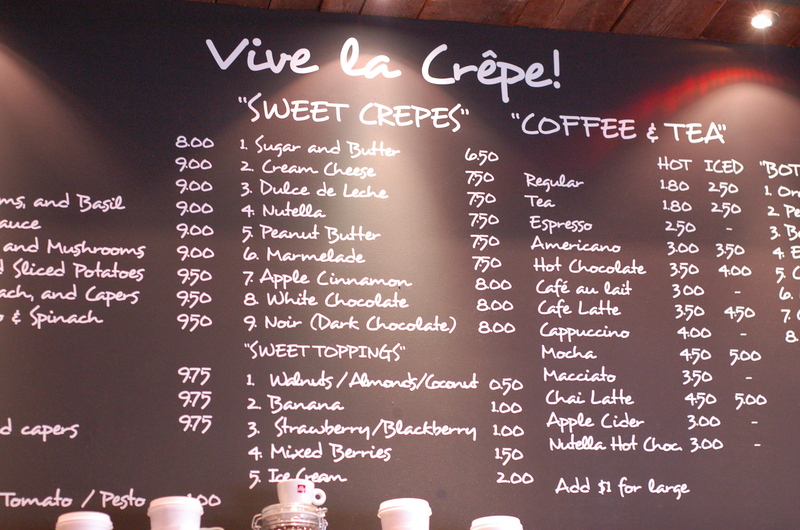 Going French with Vive la Crêpe! My dream has always been to travel Paris to indulge in the art, culture, and food of France. But with school and work currently dominating my life, my plans of traveling will have to wait until I’m able to squeeze in some vacation time. When that time comes, I’ll be committed to trying all of the delicious food that France has to offer. 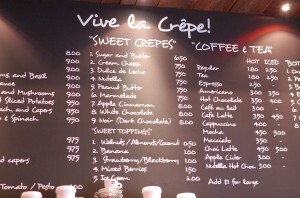 But in the meantime, I’ve found a small local café that specializes in one of France’s most popular delicacies, crêpes. Vive la Crêpe! brings French street culture into the streets of New York. Upon entering Vive la Crêpe! in Union Square, I met with with the social media manager, Kate, who gave me information on the popular eatery. Focusing solely on crêpes and café drinks, Vive la Crêpe! aims to exude an aura of “authentic French coffee shop.” It succeeds: small yet homey, with wooden walls and chairs throughout the café, each employee at Vive la Crêpe! has been trained to perfectly create the signature delicate dessert in order to provide diners with an original French crêpe experience rather than turn it into something Americanized. 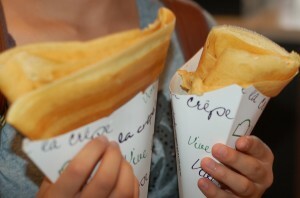 The unique presentation of the crêpes is something to be admired: served in a cone, the crêpes, which are considered street food in France and served in food carts and small storefront windows for a quick eat, are easily portable and resemble over-sized ice creams that just as easily melt in your mouth. My partner for the day, Maria, and I ordered one savory crêpe and one sweet crêpe to see if Vive la Crêpe! could tackle both worlds. From the extensive menu, we chose the spinach, goat cheese, mushroom and basil crêpe, as well as the Nutella crêpe. Soon after we ordered, we were holding two large cones of hot, freshly-made crêpes. The ingredients of our savory crêpe were fresh and clearly designed to be a healthier option with creamy goat cheese. The fresh spinach and basil, mixed with the distinct taste of goat cheese, gave this savory crêpe a light yet satisfying meal-like quality. 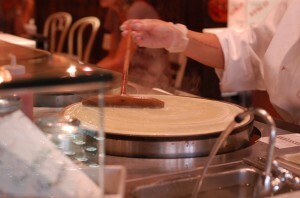 According to Kate, this is one of the most popular crêpes on the menu. 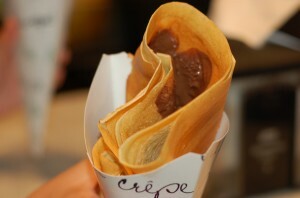 Our Nutella crepe was amazing as well, the soft crêpe sheets covered in nutty and chocolatey Nutella. Sweet and simple, the Nutella crêpe would be great as a light dessert or a snack to satisfy a sweet tooth. The layers of crêpe that encased these delicious ingredients were extremely soft and fluffy while still maintaining the traditional thin texture. None of the edges were crusty or over-cooked, and the crêpes were evenly chewy throughout. Vive la Crêpe! is the perfect place to grab a quick bite to eat, as well as a place in which you can find a great cup of espresso — all for an affordable price. Better yet, Vive la Crêpe! has a smartphone application with a QR code so that diners can redeem a free crêpe with their first Vive la Crêpe! receipt (with no expiration date!). A hot spot in NYC, Vive la Crêpe!’s Union Square establishment has sister locations in NoLIta, the West Village, and the Upper West Side so that people all over Manhattan can indulge in a great crêpe experience. 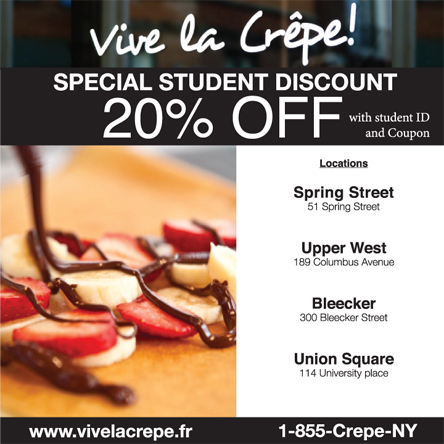 Maria and I had a wonderful time at Vive la Crêpe!, and I can confidently say that you can grab the best crêpes here, right on the streets on New York City.